So their website is a bit kludgy in the design of the user interface, it's apparent they were going for artsy-fartsy fancy-smancy instead of usability, but if you're patient you'll eventually find the classes (they're listed under "specialty" for each category, which might help). Don't try to hit the back button on your browser though, and don't think you'll be able to cut and paste the store address, class time/description, or anything else for that matter from the website though. Oh well, I'll get off my good web design soapbox now. So what HCWeaver's is missing on their website, they make up for in their shop and in their classes. Suzanne, one of the owners, is simply the friendliest person I've met. She knows a TON about weaving, and has probably forgotten more than I'll ever actually learn on the subject. She teaches the beginning weaving class which is done on a 4-harness table-size jack loom. 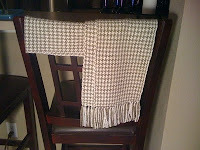 We did simple weave for our first project although others in class did a twill design, mine was a simple houndstooth. I was really nervous since everyone else in class had some loom experience and I had virtually none, none of the terminology, nothing, nada. 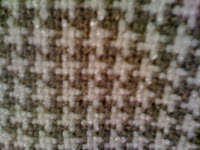 But I managed quite well and found that I really, REALLY, like weaving. And I realized I have always really liked weaving. Viking Knitting is weaving with wire. Kumihimo is weaving in the round. So it makes sense that I would love this. And I do love this! Suzanne taught us how to measure out our warp, to make our warp, to warp our loom and how to weave simple weave with 2+ yarn colors in a 2 day weekend workshop. Quite an accomplishment! It was a great class and I highly recommend it for anyone interested in learning how to weave. I finished my first project in class, cut it off the loom, and tied the knots. Then I went home and soaked the scarf in warm water with fabric softener in my kitchen sink (I have a front-load washing machine so my fancy machine can't do the stuff I need it to do for my weaving projects, rats!). I then put it in the front loader for a rinse and spin cycle (Suzanne later told me just a spin cycle and no rinse because it will take out the fabric softener, but my machines doesn't have that option, argh!). Then I put it in the dryer on the delicate cycle and it came out all wrinkled and horrible looking! I filled the water in my iron and pressed the snot out of the scarf, blocking it as I did so, and it ended up looking really, really nice. Then I took out the extra knots and pressed the fringe and cut them to an even length on both sides. Voila, my first piece. I then jumped right into my second piece, which Suzanne still helped me calculate my warp, but that I went home and warped the loom by myself! My second project was an overshot weave which was a lot more difficult to do, partly because I picked black yarn, partly because I picked a stretchy yarn and lastly because overshot isn't exactly a beginner's weave. But Suzanne had explained that I have to alternate between the overshot pattern and a tabby weave shot with every other pass. pattern. tabby. pattern. alternate tabby. pattern. tabby. pattern. alternate tabby. 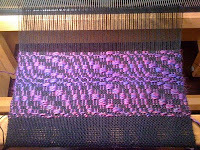 It took my 3 nights to complete the weave and take it off the loom. But then I had to stop to get caught up in my quilting class (still not caught up). And then its been sitting because of the preparations I'm making for the viking knitting class (samples and drafting instructions) that I've been asked to teach. And trying to help a friend with their resume. And trying to help a local store with their website. Egads! Burning the candle at every end I can find, I think! As soon as it's finished I'll post picks of it. So the next project I wanted to do was a waffle-weave but it requires more than 4 harnesses to get a really deep dimensional effect. Most of the weaves I want to try require more than 4 harnesses so the loom I've on loan from the store won't cut it for much longer in terms of the projects I want to do. Suzanne says I'm already becoming a "harness snob" and I liked her for saying so. As a result, Suzanne invited me to try out the store's 8-harness Mighty Wolf folding floor Jack loom. This of course means I have to dedicate time on the evenings/weekends to weave at the store, which ain't easy with the class schedules I keep! But I definitely want to do this so I'm intentionally trying to cut down on my class enrollments so I have room next month for this. If I like this, I'll need to get a loom for home because her shop is about 40 minutes from my house so not practical in terms of frequent weaving. There is a national weaver's convention for the Handweaver's Guild of America this summer in Albuquerque, New Mexico called Convergence. I'm hoping to go with Suzanne and the group. We'll see! I also told Suzanne I'm interested in basketweaving, something else on my list of things to learn. HCW offers basketry classes too but nothing for the true beginner was offered at the time. But, Suzanne, being the sweetheart that she is, got me into a non-beginner basket weaving class, stay tuned! That's so cool! I've always wanted to learn how to weave! It would get rid of all of my excess yarn (By the way, it's Gardiner from Yoga). Gardiner, you should definitely take Suzanne's weaving class! Didn't you used to hang out there?? I so love HCW!!! I'm at HCW all the time! It's just a matter of money. How much does a loom cost? See, if I took the class, I'd never want to give it up. That's the problem. Yep, the Cricket is way under $200 and it is a blast! If you get one, I have videos on my website showing how to warp it. Thanks, Patty! I ended up getting a 32" Ashford 8-harness tabletop loom, but I still wish I could have popped for that Schacht Mighty Wolf I really wanted. I just picked it up the other day and still have to assemble it...hoping I like it as well (or better?) 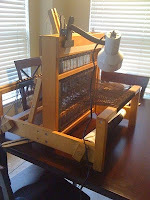 than the Schacht tabletop loom I used in class.